Tonight’s 10 p.m. wish: that other parents would get brave and take on adventures that seem unreasonable! Because sometimes a lot of work earns you a lot of fun, and milestones, and memories. And it’s worth it. 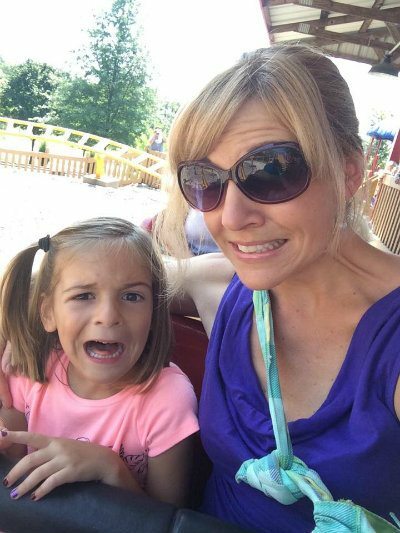 It wasn’t exactly how I planned to do Holiday World this summer – but it just so happened that I ended up loading up my car last weekend with FIVE CHILDREN and embarking on a theme park quest. Wally World, here we come. I didn’t lose any children. I didn’t lose my mind – completely. We actually had FUN. A lot of it. I remembered to pack WINE for the end of the long day. 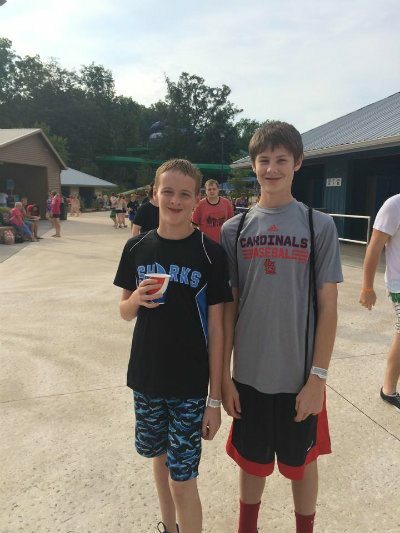 It had been years since I’d brought the kids to Holiday World, and I let Calvin and Clara each bring a friend along. (Fellow parents can understand how sometimes five kids are SO MUCH easier to manage than three. When kids are happily paired with buddies, they are much less likely to kill a sibling. True fact.) 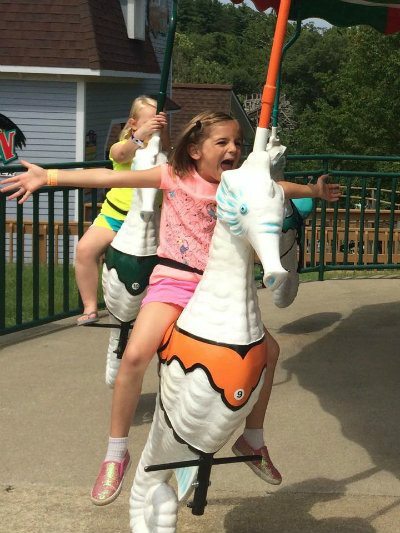 Clara’s longtime best buddy, Josie, confessed that this was her very first trip to a theme park, and first time on a roller coaster. (!) I know this girl well, and correctly predicted that she could not only handle it, but would love it. We girls sent the tween boys off to ride the big coasters, while we warmed up with a “kiddie” coaster, the Howler. Josie and Clara rocked the ride with big smiles and confidence, just like I predicted. I let Miss Daisy rebuild her confidence in the Christmas section, filled with rides perfect for the five-and-under crowd, with NO LINES to wait in. She looked like the queen of the sea while riding the seahorses for the twelfth time. Clara and Josie lined up again and again for a stomach-dropping ride that made them scream and giggle in perfect 9-year-old girl fashion. I loved watching their giddy, adrenaline-charged laughter. After a healthy lunch of ice cream cones (yeah, oops) accompanied by Christmas carols, we started to sweat, and headed to the water park, Splashin’ Safari. I think I earned some more SuperMom points for remembering to stop by the free sunscreen station and make all five kiddos coat themselves in protective lotion. The boys tried really hard not to crack uncool smiles, but I got a few out of them. I am hopelessly charmed by the conversations of these tall, lanky tween baseball teammates, which are punctuated by mild, sarcastic insults, some crude boy humor, and overuse of the word “ROAST!” Could be a lot worse. I enjoyed a few quiet hours watching girls ride the waves in the wave pool, assessing the impressive array of regrettable tattoos and swimwear. I jumped in a few times to cool off let the water wash my stress away, and soak up waterbug Daisy May’s joy. We finished up the day in the Thanksgiving section. The big kids stood in line for each and every major roller coaster while Daisy and I experienced the full effects of centrifugal force on the spinning turkey ride, a few too many times for my taste. The sun had set and the moon was high as we made our way back to the parking lot. Snoring echoed through the car as I drove us to our hotel. I got the exhausted quintet settled into beds and air mattresses, then filled the bathtub and savored one of the best glasses of red wine I’ve ever had. I paused a moment to take it all in. I took five kids to Holiday World.